As summer draws ever so near, it's time to start packing away those cosy winter shoes and pick up the perfect pair of summer sandals so you can enjoy those warm rays from top to toe – and look like a super-styling seasonally appropriate strumpet while you're at it. Like our trusty, versatile ankle boots in winter (we miss you ankle boots! 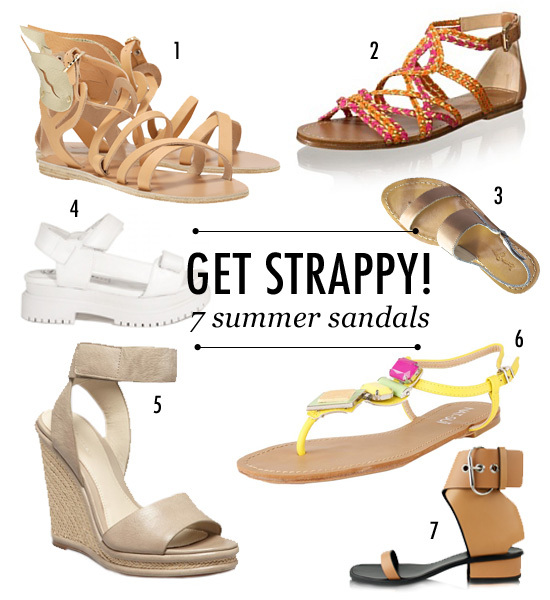 ), summer flats should be easy to wear and ready to follow you through your summertime adventures. Whether you're looking to dash down to the beach or dress down for summer cocktails and good company, this season it's all about statement sandals. Among this season's favourites are colour-splashed espadrilles and gladiator flats. White shoes have also returned to favour, adding the final touch to all-white ensembles (and before you start whinging, a pack of baby wipes is all you need to keep these puppies fresh). A welcome change from black, whites and metallic will only enhance your summer glow.